Andrés Manuel López Obrador has coasted through the artificial, arbitrary and frequently anticlimactic hundred-day gate with the wind at his back: an 80 percent approval rating and the sense, like few presidents in modern Mexican memory, of reshaping the office in his image. AMLO, as he is known for short, has proven to be a consummate master of political imagery. Within minutes of assuming the presidency on December 1, 2018, he opened the lavish presidential residence Los Pinos to the public for the first time. Hours before his inauguration, the first curious visitors were already wandering wide-eyed through a sumptuous series of rooms that, in symbolic terms, carried similar weight to the unveiling of Ceausescu’s Spring Palace in Bucharest. AMLO rode to the inauguration from his private residence — where he continues to live — in the same simple Volkswagen Jetta subsequently used to usher around visiting heads of government such as Spain’s Pedro Sánchez. And with the windows down, he allowed a cyclist to ride up and wish him well with the words: “En ti confiamos.” We trust you. Once in office, the new president continued to dismantle the trappings of the imperial presidency, putting the opulent presidential plane — acquired for some $218 million dollars in 2012, just in time for the presidency of Enrique Peña Nieto — up for sale, together with sixty other governmental planes. AMLO, for his part, would fly coach. And whereas Los Pinos was opened on his first day, the president took advantage of his hundredth day to officially close the Islas Marías penitentiary, the once-feared gulag of torture and torment that housed, among others, the Marxist writer José Revueltas (the novelist’s time in the prison forms the basis of his 1941 novel Los muros del agua or “Walls of Water”). Whereas former presidents restricted press access to a combination of carefully scripted public events and fluffball interviews with friendly media, AMLO gives a morning press conference every day for upwards of two hours at a time. Far from saturating his image and subjecting him to debilitating attacks — the warnings of high-paid handlers the world over — the mañaneras, as they have come to be known, have set the agenda for both the nation’s politics and its front pages. In a sign of the times, the archive of past conferences is now available on Spotify. AMLO’s results in the policy terrain have, inevitably, been more nuanced than his masterful public image maneuvers. As promised with disciplined insistence during the campaign, AMLO wasted no time in attacking the kleptocratic state inherited from Peña Nieto, lowering the bloated salaries of top bureaucracy, reforming the bidding process for government tenders, and launching a war on the multibillion-dollar industry of gasoline thievery that literally fuels the nation’s criminal economy. He’s also quickly rolled out a series of social programs, including a modest universal pension for over-68s and those with disabilities, a scholarship program to allow young people who are neither studying nor working (known in Mexico as “ninis“) to receive training and apprenticeships, a system of microcredits for areas of high marginalization, and a centralization of the nation’s scattershot health care system with the promise of phasing in some form of universal coverage over two years. In other areas, presidential inaction has been enough to allow advances to be made. In mid-January, the “20/32” strike movement began spreading through the Ciudad Industrial maquiladora zone in the city of Matamoros, located directly across the Rio Grande from Brownsville, Texas. 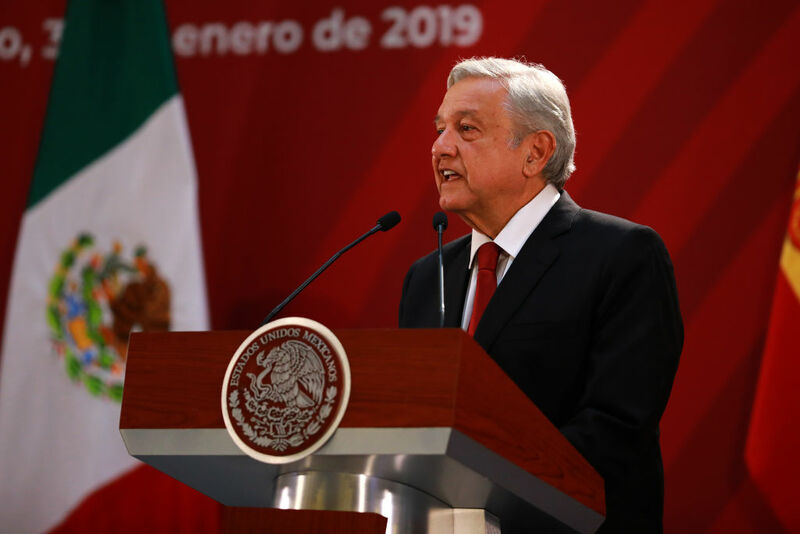 The action was spurred by AMLO’s doubling of the minimum wage in the border area, which activated a collective-contract clause requiring any wage increase to be reflected in the salaries of all workers, even those making more than the minimum. In response, workers demanded a 20 percent across-the-board raise and an annual $32,000-peso ($1,665 US) bonus. When their demands were refused, they took to the streets. “While some point out that the AMLO administration’s failure to strongly stand with the strikers calls into question his Fourth Transformation’s reputation as a ‘leftist’ movement,” writes NACLA’s Daniel Blue Tyx, “the fact that the government didn’t take the side of the companies, in fact, represents a significant change.” In previous cases of labor unrest, companies would simply get the federal government to declare the strike illegal; that did not happen this time. Another example of active neutrality has come on the foreign-affairs front. By standing up to both the Trump administration and the Lima Group (of which Mexico is nominally a member) in refusing to recognize Juan Guaidó as the interim president of Venezuela— and further, by refusing to go along with the International Contact Group’s call for new elections — AMLO has provided an important regional counterweight to right-wing governments such as Argentina, Brazil, and Chile. This has helped curb the momentum of the imperial rush to war, providing a breathing space for negotiations of a non-aligned nature to take place. While it would be silly to assert that Mexico alone could hold off a Bolton/Abrams-stoked invasion of the beleaguered Bolivarian republic, its reclaiming of the historical mantle of state sovereignty — a long-standing tenet of Latin American jurisprudence in its struggle against international interventionism — has a value that goes beyond the merely symbolic. Other aspects of AMLO’s relationship with the US, however, have been less forthright. Since taking power, he has accommodated — to a fault — Trump’s border policy, seeking to provide visas and jobs to Central Americans in an attempt to curb migration, allowing asylum seekers to be returned to Mexico while their cases are processed with only a mild statement of disagreement, and refusing to speak out against both the American president’s inhumane policy of family separation and his repeated insistence on building a border wall. AMLO is clearly banking on behind-the-scenes persuasion standing a better chance of success than a high-profile, asymmetric war of words. But, although Trump has been unusually measured when referring to his Mexican counterpart, it is unclear what else Mexico is gaining by opting for the soft sell. While AMLO is going along and getting along with Trump’s bellicose border policy, he is also proceeding with the militarization of the Mexican side of the border. At the end of February, the Morena-controlled Congress approved — and the state legislatures quickly ratified — a series of Constitutional reforms allowing for the creation of a Guardia Nacional, or National Guard. The combined civil-military force will be made up of members of the Federal, Military, and Naval Police under the joint command of the Defense and Public Safety Departments. While the guard is being built up, the armed forces proper will continue to participate in internal security measures for a period of five more years. AMLO is clearly in an unenviable position: with violence unabating and police across all levels infiltrated by organized crime in multiple regions, a hybrid force under (ostensibly) civilian command, with a firm end date for the armed forces to return to their barracks, represents a defensible compromise. That, however, is scant comfort to the victims of decades of human-rights violations and extrajudicial killings perpetrated by Mexico’s armed forces. And in light of AMLO’s handing over the construction, administration, and profits from the revamped airport in Santa Lucia to the army — without tenders of any kind — the new president’s relationship with the armed forces remains under necessary scrutiny. Under scrutiny, too, is AMLO’s seminal infrastructure project for the south: the tren maya, or Mayan Train, a 1,500-kilometer railroad designed to ferry tourists around the archaeological sites spread across five southern states — Chiapas, Tabasco, Campeche, Yucatán, and Quintana Roo. Following a tokenist “asking permission of Mother Earth” — but without, yet, consultation with the region’s indigenous groups — AMLO announced the project would proceed, pending the necessary feasibility and environmental studies. In a sign of the kind of development the project is already attracting, Spanish hotel chains have declared their interest in constructing a series of posh units along the line. In addition to sucking millions of gallons of water from the region’s aquifers, these hotels will offer only precarious, low-paid service jobs while further threatening the cultural integrity of the region. Former indigenous presidential candidate Maria de Jesús Patricio as well as the Zapatistas have condemned what the latter have coined “el proyecto de muerte” — the death project. Others, like the nationally recognized Oaxacan artist and activist Francisco Toledo, have criticized the train as a potential ecological disaster. The point is well-taken: of course it is better to produce electricity publicly — building up the nation’s energy autonomy — than purchase it from subsidized private providers. But that begs the question: why not repeal the Energy Reform Law that opened the sector to those providers in the first place? Tragically, just days after AMLO railing against “left-wing radicals,” a longtime activist against the Huexca project, Samir Flores, was gunned down. Even so, AMLO went ahead with another of his off-the-cuff consultas, or plebiscites, organized on the quick without the opposition having the time or resources to oppose the government’s massive bully pulpit. The plant project won with 59 percent of votes cast, but rural and indigenous activists denounced it as a victory “manchada de sangre” — stained in blood. As AMLO should well know, there is more than one definition of “conservador”: it can also refer to those who conserve social and cultural practices and the natural world from destruction. On February 14, in another awkward miscommunication, a presidential order announced the cessation of governmental subsidies to all social organizations, unions, civil, and citizen movements. At stake was $30 million pesos in direct government subsidies. In the neoliberal era, the leeching of core state functions to an unelected, unaccountable army of NGOS and “civil society organizations” has represented a deliberate strategy of undermining the state. In that context, AMLO’s decree was clearly in the right. “They created this idea of civil society, satanizing and stigmatizing the government. If the work is done by the government it won’t be efficient and they’ll rob it all, so better to give it to us [civil-society organizations],” he stated at a press conference. What was intended as a strike against corruption and the outsourcing of the state, however, was quickly spun by media as an attack on the vulnerable. Included among organizations whose funding would be cut were refuges for women escaping violence. In a country where 3,580 women were killed in 2018 and 66 percent of women have experienced some form of violence, it should have come as no surprise that a sudden funding cut would produce an angry reaction from a network of 190 refuges across the country. AMLO’s own stumbles only exacerbated the issue. Rather than simply reassuring the public that crucial services such as shelters would be protected during the transition — as he did with the phasing out of the Seguro Popular health program — he made the insensitive suggestion that at-risk women should receive money in a debit card, as if that were a substitute for a safe place to go. A similar furor was sparked by AMLO’s comments on childcare. For years, the government has outsourced day-care provision for both the IMSS health care system and a separate network of estancias infantiles, to a series of poorly regulated, private day-care centers financed by a ripe-for-corruption system of per-child reimbursements. The results, in at least once instance, have been deadly: a 2009 fire at the ABC daycare facility in the City of Hermosillo killed 49 children between the ages of five months and five years, leaving 106 more injured. It was later determined that the blaze was caused by the overheating of a power outlet, leading highly flammable substances in the paper warehouse where the facility was precariously located to catch fire. In this case, too, AMLO’s government mooted the idea of ending subsidies to these facilities, opting instead to provide a monthly payment directly to parents. Such a voucher system, in the absence of universal day care, is likely to funnel the money back into the private sector. While these plans were later qualified both by AMLO and his Secretary of Well-being, Maria Luisa Albores, who promised that no refuges and day cares providing proper services would be closed, the damage had been done. These stumbles may be symptomatic of deeper issues at the heart of the cuarta transformación — the fourth transformation which AMLO promises will revolutionize Mexican politics and society. AMLO’s lofty rhetoric and frenetic activism — he repeatedly declares that he works “sixteen hours a day for the people,” a claim few would doubt — allows it to seem, as columnist Julio Hernández López suggests, like big changes are in store even if, in the end, market forces will limit what his government can achieve. What Hernández López calls the “invisible guillotine” has already made itself felt in the new government’s first one-hundred days: on January 29, the Wall Street ratings agency Fitch downgraded the debt on Mexico’s national oil company, Pemex, to just above junk status. On March 2, Standard and Poor’s (S&P) announced that AMLO’s first ninety days had “affected the confidence of investors” and therefore justified the downgrading of Mexico’s public debt from stable to negative. This, despite the fact the government’s first budget largely remained within neoliberal strictures, moving money around without levying new taxes on the wealthy or corporations. The cravenness of the ratings agencies — they were willing to award positive evaluations to the Peña Nieto government while collecting approximately $1.3 million dollars in government contracts — should surprise no one. What may surprise some is how quickly the coercive power of “market forces” has been unleashed on a government which, so far, has done little to disrupt their basic logic. But, as the cases of other left governments in Latin America have shown, making concessions to neoliberal capitalism is no guarantee that the invisible guillotine will not decapitate best-laid plans. The challenge for the Mexican left in the coming months will be to find a way of working both with and against AMLO’s government. It must defend the government from the Right while simultaneously pushing it further when its reforms either do not go far enough or go too far in damaging indigenous rights and the environment. Although AMLO’s party, Morena, is politically uneven, it remains a diverse and national movement that has become a repository for decades of pent-up grievances, aspirations, and demands, often exceeding what its leadership is willing to offer. After a hundred days, some sections of the Left have already written off AMLO’s government as hopelessly compromised. But maintaining the balance between solidarity and critique is crucial to standing with and alongside the millions who, in the face of fraud, violence, disappearances, and years of crushing inequality, have succeeded in bringing a new government to power.